If you are planning to attend any portion of the General Assembly meeting in Detroit, please let our Executive Presbyter know by emailing at ralph@shenango.org. He will be in Detroit for the entire week, and would like to connect with as many Shenango members as possible. Six Shenango churches in the New Castle area shared worship together in celebration of Pentecost Sunday. 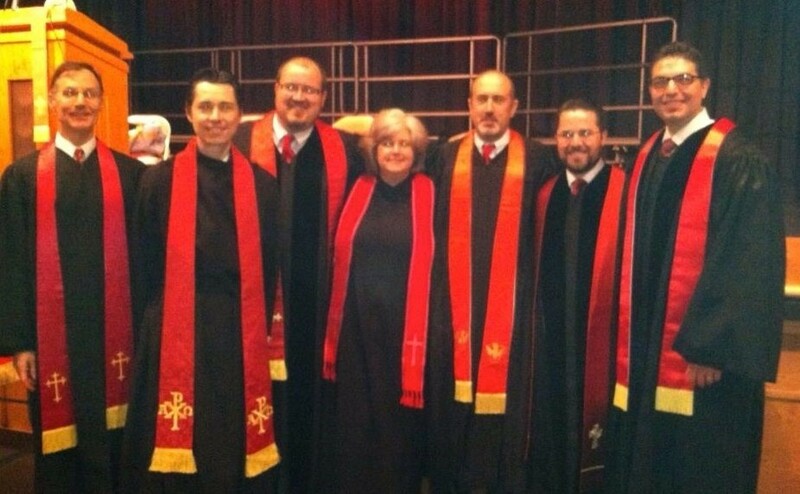 Pictured here are the New Castle pastors before and after the service. Churches involved were Northminster, Highland, First, Third, Shenango, and Clen-Moore. A blessed morning was enjoyed by all. Trinity Presbyterian Church in Mercer will be holding a summer rummage sale on Friday, June 13 from 8 AM – 4 PM, and Saturday, June 14 from 8 AM – NOON. Saturday is 1/2 off day with clothing $1/bag. Proceeds to support missions in Niger and Jordan. Hillside Presbyterian Church of Greenville is seeking applicants for a part-time secretary, with a starting date of 9/8/2014. The position would require the applicant to work four hours, M-F. Applicant should be proficient with computers and have communication and interpersonal skills, and secretarial experience is preferred, but not required. Salary is commensurate with experience. Interested applicants should send a resume to HillsidePersonnel@gmail.com.